My local greengrocer was struggling. A new supermarket had opened in the area and was undercutting his business. 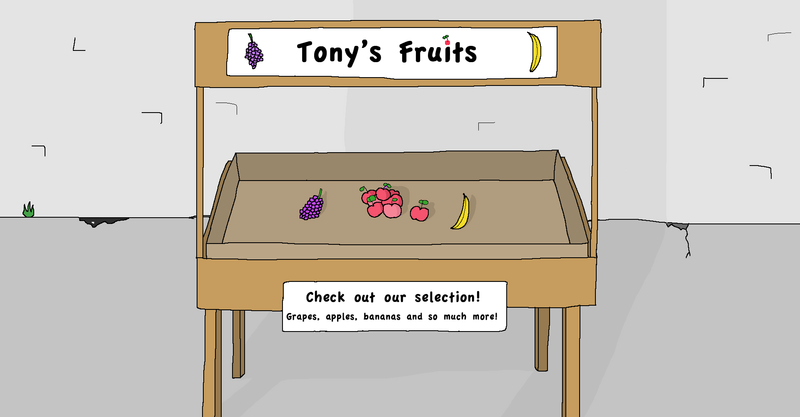 He decided he needed to reduce his costs so he stocked less produce. He successfully reduced expenses but lost clients and promptly went out of business. He might have survived had he niched the business, and increased the personal service. When I opened my first practice my accountant advised me to control expenses. He suggested getting 3 quotes for all purchases over $200. He also suggested I keep a cap on wages. I was becoming a greengrocer dentist. We spent time and energy reducing expenses and were focusing on the wrong end of the problem. Fortunately, I tracked my numbers and realized what was happening before it was too late. Study the tables below. Let's say you are a dentist with the production and expenses shown in Table 1. **Marketing This is a discretionary expense. Typically, it is anywhere between 5-15% of Production. We have used 5% here. 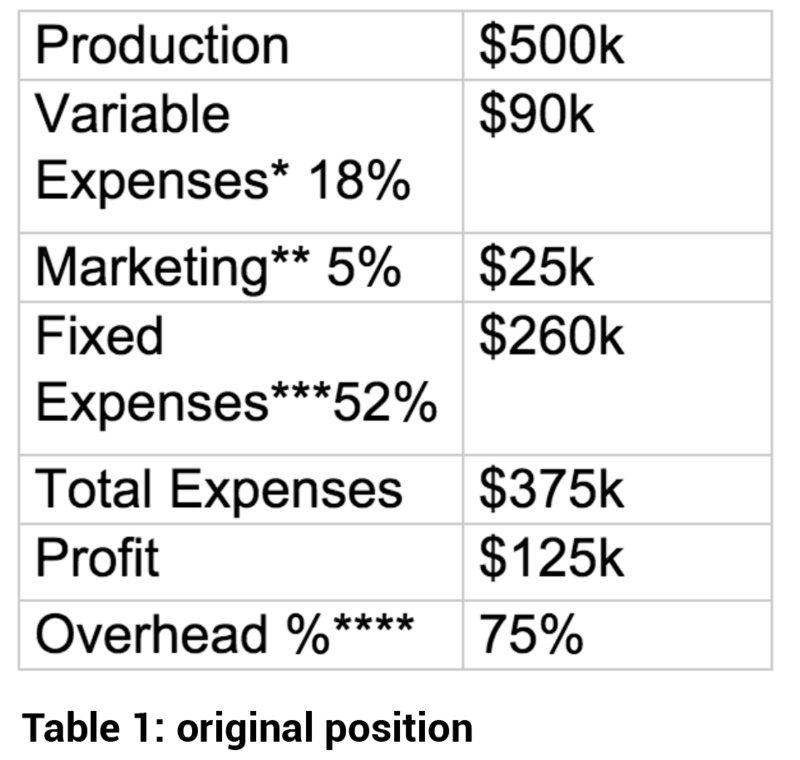 ****Overhead% is your total expenses ($350k) divided by your total production ($500k). The Greengrocer Dentist would look at these numbers and want to reduce the overhead, in order to boost the profit. With a lot of time and effort by the staff, essentially paying them to chase cheaper prices, it is possible to shave the costs of supplies down by about 10%. 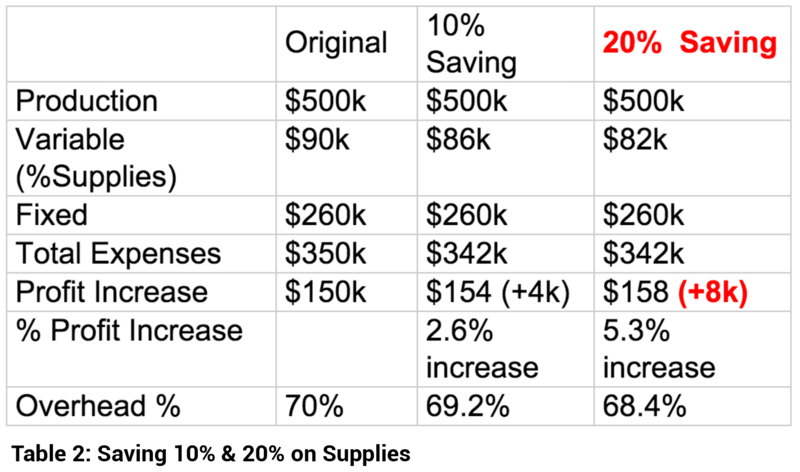 Let us be very generous and say 20% is saved: a possible saving of 4-8K/year. See table 2. 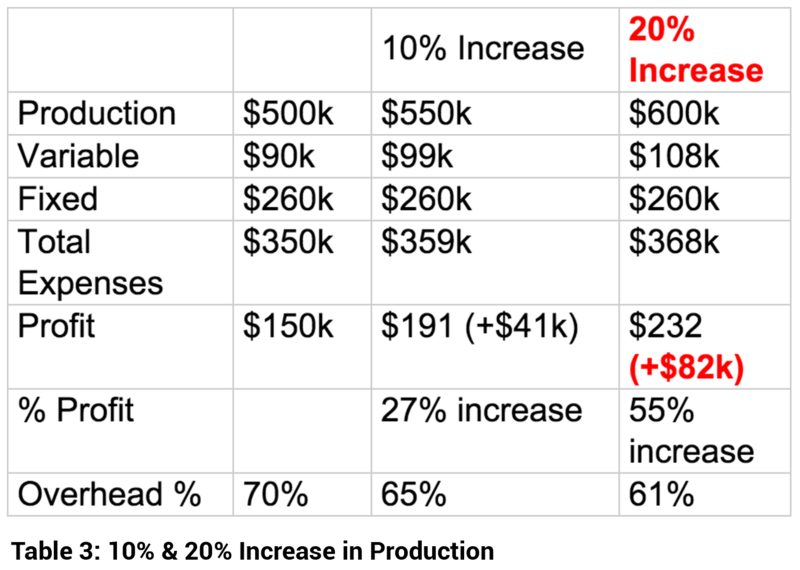 Before you launch your staff on an expense-slashing witch-hunt ask yourself: “Are your expenses too high or is your production too low?” See what happens when this practice boosts production by 10% and by 20%. See Table 3. This is particularly true in dentistry. All the time spent phoning around to get cheaper deals would be far more profitably spent, if staff focused on building relationships with the patients. Paying the minimum wages will probably result in low quality, dissatisfied and overworked employees, thereby reducing your service levels and so reduce your production. Increasing the advertising budget can be fine as long as the advertising % doesn't keep growing. Ideally both production and advertising are increasing in dollar terms and the advertising % (say 5%) is the same! If you started at 5% and are now at 10% or 15% it could be because your production is not keeping up with the $ spent on advertising. In other words, you are spending more and getting diminishing returns. If your overhead hits 75% you are in a danger zone. The smartest operators understand the power of internal marketing. It's the most effective and cheapest way of growing. I instituted a half day team training session every Wednesday afternoon. We increased our appointment times so that we had more time to speak with patients. We took more photos of before and after treatment and we implemented a range of communication protocols that resulted in patients making much better treatment decisions. When more patients make better treatment decisions, you'll see better business numbers. The biggest variable in your patient's decisions is your practice's ability to communicate. The patient gets to have higher quality care; the dentist gets to deliver more satisfying quality work and the practice thrives.